These words came to mind after traveling 286 miles on the Colorado River, from Lee’s Ferry to Pierre’s Ferry on a science trip I was privileged to work on. 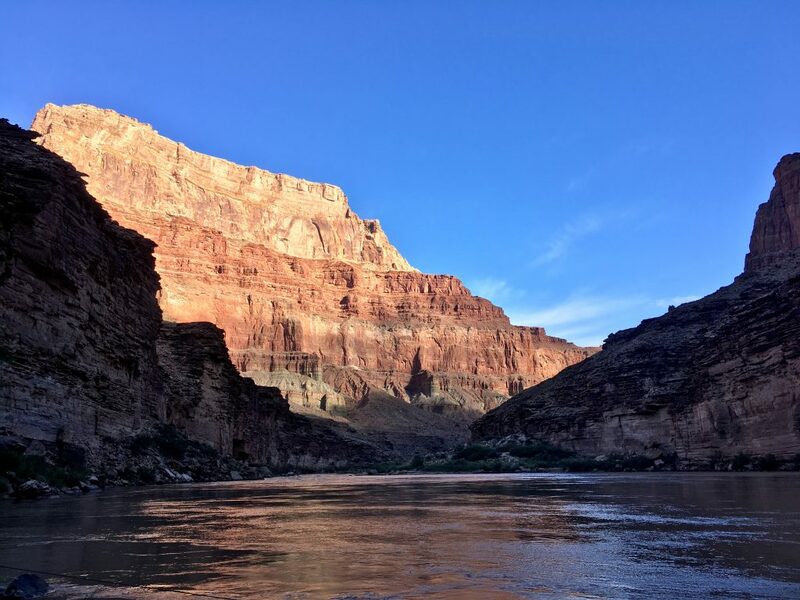 Reflecting on the rapids, beautiful colorful rock layers, and many nights camping along sandbars, I still cannot believe I did a river trip through the Grand Canyon. 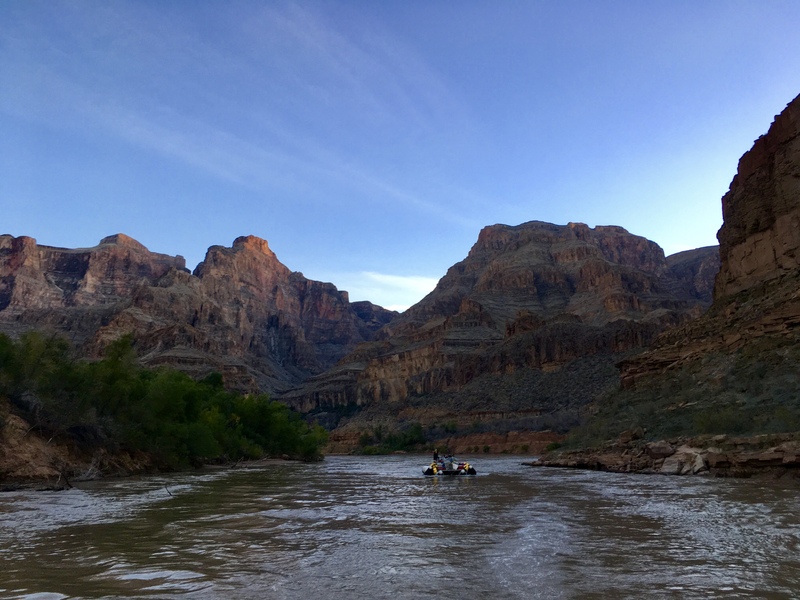 Leaving the outside world behind for 24 days to help study several fish species found in the Colorado River was challenging… but overwhelmingly what I felt was peacefulness. When I first signed onto this trip my goal was to see and learn as much as I could while working during the day and night. What I noticed the most however was the silence, stars, river, and my own altered mental attitude. 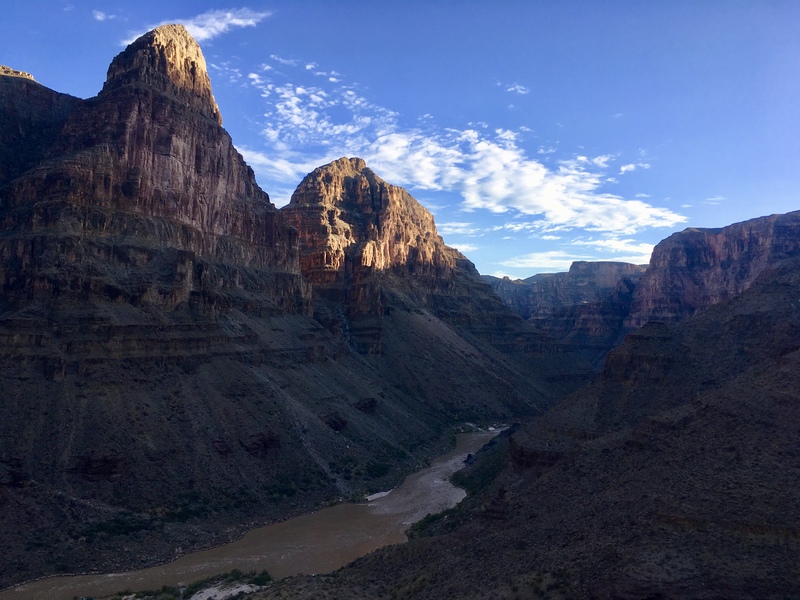 Before leaving on this trip I thought I would grow intellectually… what I didn’t anticipate is that I would be learning much more about the canyon on my own, and not from books and science that I anticipated. The Canyon speaks for itself. 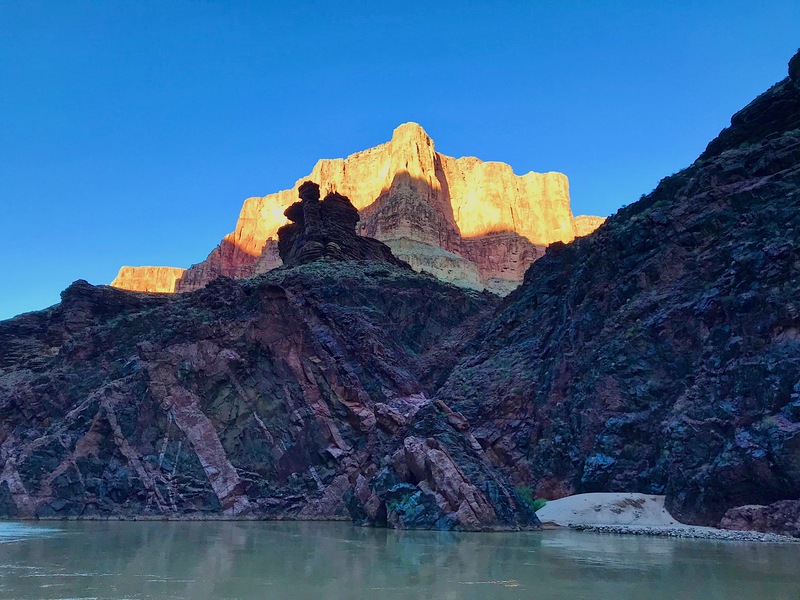 There is silence when one ventures alone to truly take in all the emotions and greatness this place has it offer, once its interrupted by the roaring Colorado River. There is no notification sounds coming from my iPhone, alerts from family, friends, and social media. There is no cars heard in the distance. Best of yet for me, there is no questions like “Excuse me sir, where is the Grand Canyon?” Yet in certain areas of the canyon, the occasional helicopter is heard up from above. After working all day catching fish, I would walk away from the campsite, either sit along the shore of the river or hike somewhere. Once I became isolated, I would listen. Nothing is making loud noises around me, several miles probably. This is peace. I look around me. I look up at the giant red wall limestone cliffs surrounding me, and see nothing else from above. I cannot truly see the rim of the canyon. I look at the vegetation around me. Most of the plant life down here is semi-desert grassland/ shrub steppe. The Colorado River. Grand Canyon would not be grand if there was not an ancient river downcutting through it for millions of years. The water was very clear and mildly rough after leaving Lee’s Ferry, making our way down to the Confluence. After our boats passed the Confleunce, the river’s color turned into a brown, murky color. Sediment from the Little Colorado River is transported into the Colorado River this way, and is a beautiful, sacred area for people to visit. Many miles downstream, the water becomes more rough retaining its beauty. There are bigger rapids that were exhilrating to go through, and just plain terrifying. Hermit Rapid was my favorite rapid to travel through, because there is three huge waves to pass through. It felt like going over a rollercoaster ride for me, once you go over a wave, you fall back down towards the water and hit the next wave becoming soaked in water. Lava Falls, would be the terrifying rapid of my choice. I remember the day before we were going to run Lava Falls, most of the crew was constantly talking about it. Stories of boats flipping after hitting the first wave, people getting pulled under the water after falling out of boats, and just how big the rapids are. Luckily, this time of year the river is flowing below 10,000 cfs so the rapids will be small. Approaching the rapid I gripped onto straps on the boat, and it actually was not so bad. Because again, the water was super low, but we did get soaked and one of out boats did malfunction going through the rapids. Luckily it did not flip and the person navigating the boat was alright. After passing Diamond Creek, the river starts to transform into smooth, slow drifting, lake water. 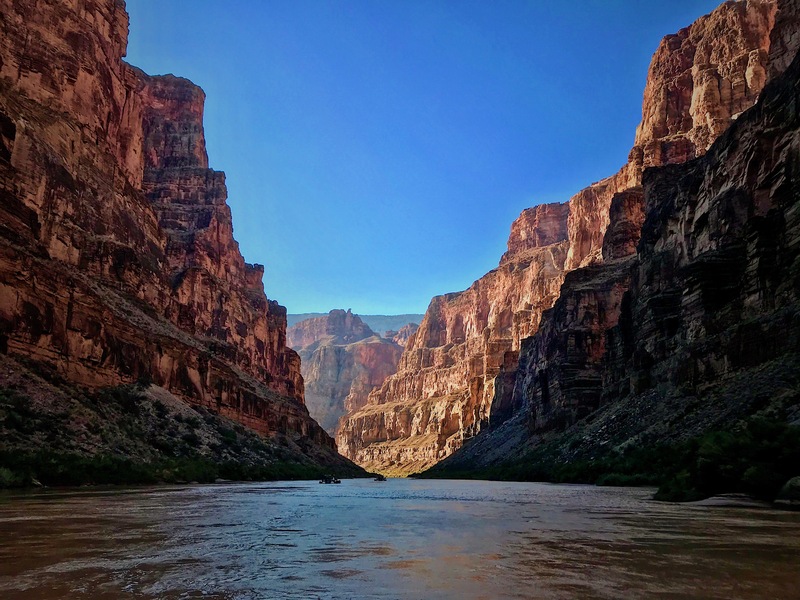 Spending 24 days in the Grand Canyon on a river trip, without any communication and comforts of family, friends, social media, WiFi, dogs, junk food, soft comfortable beds, and just good food, took some adjusting to. What hit me the most, was constantly checking my phone for signal down below and that I was down there for quite a while. Most rafting trips going through the Grand Canyon last 16 days, but we were down there an extra few days to monitor fish species. What I brought along to pass the time, was books and my iPad. I brought about ten books and loaded my iPad with movies. Reading books helped pass the time, lowered my anxiety, which was amazing because I have not read a book in a year or so. My iPad helped a lot, but it did have a 10-hour battery life. Luckily with our equipment, we had generators to power our lab-boat when we had to process the fish, and also we used them to charge our devices. I brought along a solar charger just to use for my iPhone. My phone is loaded with music and I cannot function properly without my tunes so I made sure it was charged everyday. 10 days into the trip, realization of being in the Grand Canyon for another 14 days hit me hard. I read half of my books already and rewatched all of my downloaded content at this point. What kept me going was just the matter I would be seeing more of the canyon downstream and that we had food and beverages leftover. Day 18 into the trip, our food supply had hit rock bottom and I was ready to get out. I craved sugary beverages and “delicious” fast food. That’s how my mind was thinking – fast food was actually “delicious” to me. I already accepted the fact that I would be dirty for another six days and my skin was getting darky and drier by the minute. All I had left, was counting down the days, taking long naps after work, and completing the rest of my books I had left. I thank J.K. Rowling for giving the world the amazing Harry Potter books. On the last day we got out of the canyon, we unloaded the boats and our gear, set up camp and instantly went to bed. A few of us knew that just down the road at Pierre’s Ferry, there was a spot with cellular reception. I immediately bolted to the location with my phone. I think this disappointing a few people on the trip, that I was the one person on the trip enslaved to his devices. I was eager to check in with my family, because being down in the Grand Canyon – accidents can happen. My parents in particular, were not fond of me going on this trip. I relieved them with a text message and phone call. What annoyed me the most was the instant reply, “SEND US YOUR PHOTOS.” I was ready to head home, order out pizza, and lay in my bed again. Backing up to the last few miles we had left before making our approach to Pierre’s Ferry, some emotions came up. Looking back into the canyon as it slowly drifted away from our boats, I felt relieved to be out, but mostly I felt this empty hole in myself. Spending 24 days traveling through Grand Canyon was plenty of time to work and enjoy its magnificent views. It was not enough time to explore every side-canyon, sand bar, rock formations, springs, waterfalls, pictographs, etc. There is so much to see and explore down below, but with the time I had I made every minute count. Even once the sun no longer shined in the canyon after we went through a roaring rapid, soaking all our clothes and gear, I managed to have a smile on my face as my body shivered. This was a big trip and I was glad to be apart of it. This was my first time going on a river trip through the Grand Canyon. I gained more respect for this place, this home. 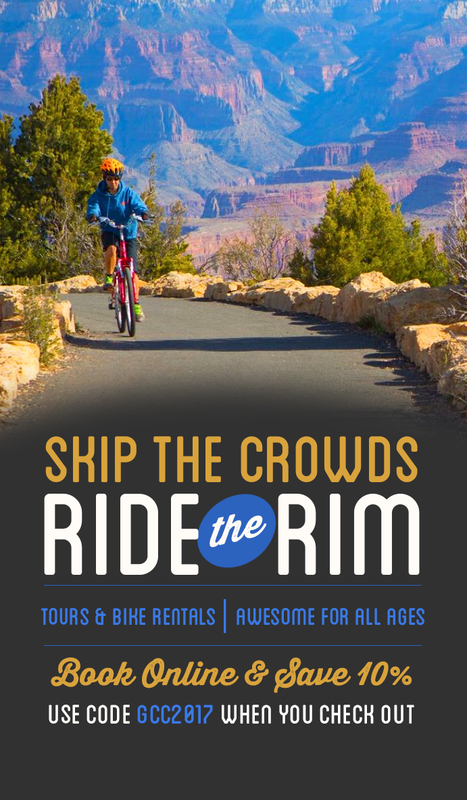 I encouraged whoever is reading this, to consider taking a river trip through the Grand Canyon. It is a must. It is life changing. Its its own world down below, separated from a world taken over by technology. 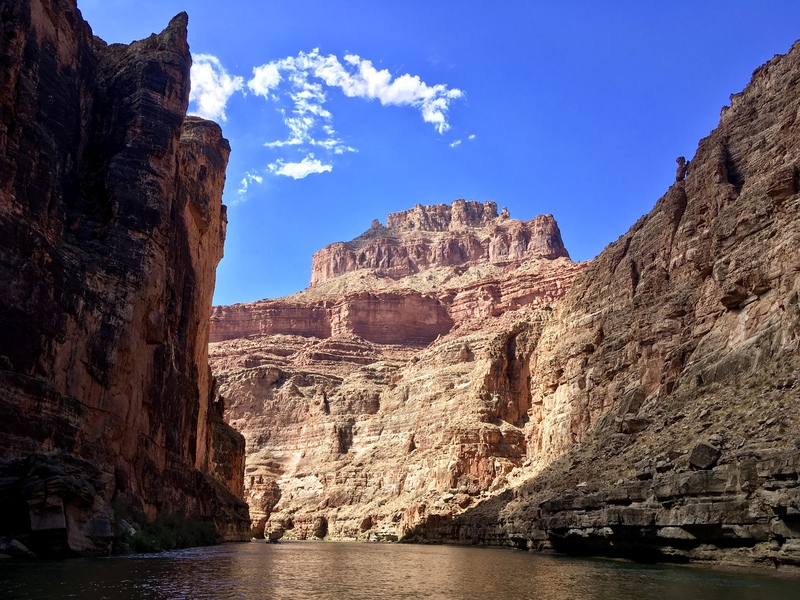 You will enjoy sitting on a boat, looking up at canyon walls thousands of feet above you, not regretting the decision to venture down in the Grand Canyon. Everyone on these trips have a good time, and the river guides really take care of you. It’s just a really good time to enjoy the outdoors. It is also a good way, to cleanse the mind from staring at a phone screen all day long. A kind river guide told me that being on the river in the canyon was being in the “real” world, that this was living life. I will remember those words and use it as motivation to seek another river trip going down the canyon, to explore more than before. John explored with river with the Park service on a scientific expedition. If you would like to do a river trip, check out http://www.raftarizona.com/ or http://arizonariverrunners.com/ to have your own life changing adventure at the bottom of Grand Canyon.